Browse our FRP grating options below for availability, load tables, deflection data, specifications and more. Contact us for current FRP grating prices or click here for specials. 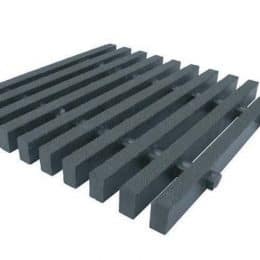 Need to buy molded FRP grating instead? Click here to learn more. PROGrate pultruded grating has the strength of steel, but it won’t corrode like steel can. A quartz grit anti-slip epoxy coating enhances traction. Continuous glass rovings resist tension, compression and bending while providing longitudinal strength. Continuous glass mat increases transverse strength and resistance to impact. PROGrate pultruded grating is available in two resin systems, each providing different levels of corrosion protection. Both resin systems meet Class 1 Flame Spread Rating per ASTM E-84 test standards. VFR: A vinylester resin system that provides the highest level of corrosion protection. Standard colors: Yellow and Gray. *Note: Dimensions are nominal. Not all panel sizes are stocked in every resin series and color. Check inventory for availability.